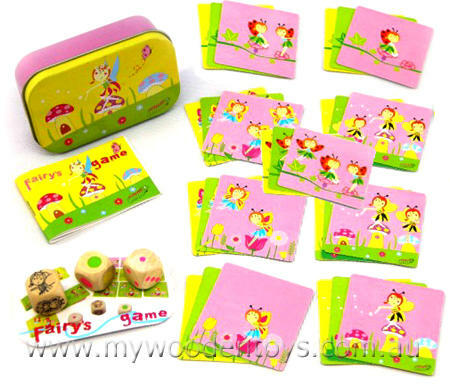 Mini Pocket Fairy Princess Game is a sweet portable little game all kept safe in a little brightly coloured tin box. This mini game is for two plus players and contains twenty seven coloured cards, two dice and instruction booklet. Each tin consists of 3 dices and some picture cards. The aim of this game is to collect as many cards as possible. Game instructions are included. A great game of chance that can be played with varying degrees of difficulty all of which is explained in the rule booklet. Material: Tin, Wooden Dice and cardboard cards, child safe paint. We like this because: "Fun little game, great to take anywhere. "